Monday an image was sent to the AAVSO email account and forwarded to the staff. 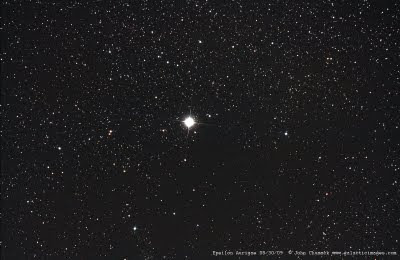 It was a picture of epsilon Aurigae and the surrounding star field taken by John Chumack, an AAVSO member and as it turns out, a professional astrophotographer. I was so impressed by the image I emailed John and asked him if he would grant me an interview so I could learn more about him, his connection to the AAVSO and his obvious love for the night sky. As it turns out, John has been sharing his work with the AAVSO and the world for twenty years now. Shortly after embarking on his new career he got involved with AAVSO assisting with the educational program 'Hands On Astrophysics' in the 90’s. “ I was the astrophotographer for it. At the time (1993-1996) I worked with Dr. Janet Mattei on the project. I think there were 52 other astrophotographers that put in proposals, but out of all of those they chose me. That was my first grant, so that was awesome. I started in ‘89, working on NASA’s Ulysses Project, which was to image comets to measure the comets’ ion tail, and then correlate that data with the Ulysses spacecraft." So how does one become a professional astrophotographer? "It got started as a hobby, but I’ve been doing it for a living for the last twenty years. I designed my own 16-inch telescope, a big fork-mounted equatorial, and the drive system for it, using a tape measure and a 1-horsepower motor. I took that to Astrofest in Chicago, three days after I finished it, and won an award for the design. I took it home and the local newspaper did a write up on my award. I started shooting the night sky with the telescope after that. I asked John what inspired him to do an image of epsilon Aurigae. “Well I’ve done shots of that part of the sky before, constellation images of Auriga and that area. I’ve got over 35,000 images. I image the sky prolifically; I’m constantly out there. Now I have an entire observatory complex in Yellow Springs, Ohio, where I have multiple scopes running at the same time. I remembered reading about this mysterious variable that’s been stumping astronomer since 1821 or something like that, so I thought let me go take a shot of this star. I know I have wide-field images of it, but I don’t have any close up shots of it. So I took about a total of 45 minutes exposures, several images stacked, they’re about 5 minutes apiece. Once I had the picture I was looking at the field of view there and I noticed that the stars are evenly distributed across the entire field, except for the one quadrant. If you look at the image, from about 3 o’clock to 6 o’clock, it’s devoid of stars. So that tells me right there that there is a large dark molecular cloud blocking the light from background stars. John’s excellent website is called Galactic Images.com. You can find examples of his work and a schedule of art fairs and shows he will be exhibiting at this year. After talking with John for a while, and looking at pictures of him at his observatory, I realized we’d met before at Arts, Beats and Eats in Pontiac, Michigan a few years ago. I remembered him telling me about his 16-inch telescope and ogling his fantastic images. Small world, eh? Sometimes we get so wrapped up in the science, we forget just how stunningly beautiful many of these subjects are. Thanks for the picture, and the reminder, John. Is that the same molecular cloud that is going to eclipse the star again as it has every 27 years? If so, I wonder why it hasn't been imaged before? Why are astronomers having such a hard time figuring out what blocks epsilon Augirae? Clearly the object has to be a massive cloud and now it looks as if you have photographic images of it. Is that what it took, just one astronomer stepping back and imaging the scene, while the so-called pros spent all their time going over the computer printouts. What else is being missed because no one just stepped back and acted like a real astronomer from the days of yore. No, the molecular cloud in this photo is not the object that is eclipsing epsilon Aurigae every 27 years. The object eclipsing the primary in that system is too close, too small and too far away to be resolved by any amateur instruments. Love your Web site, BTW. Especially your smack at the Chandra team for failing to relate something so amazing as a black hole consuming a star to the general public. We need that bridge between science and the masses more than ever. Carl Sagan is no longer around to do this.